Detail : Paul's twenty-third solo single. This incarnation featuring : Paul, Linda, Denny Laine, Lawrence Juber and Steve Holly. 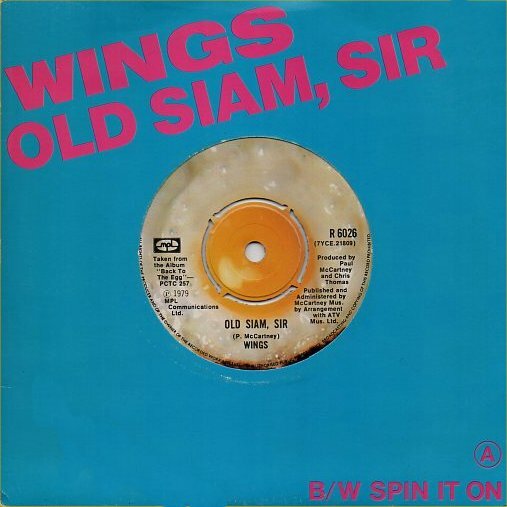 Released one week before the the album, "Back To The Egg", and just a couple of months after "Goodnight Tonight"
which had been Paul's third biggest selling single, "Old Siam, Sir" performed very badly chart-wise. The single was released in a styled coloured sleeve, and the record label featured a fried egg. Although still with a Parlophone number, Paul was back with no label mentioned except "MPL". The run-out groove has "NICK W" on the A-side.